In these posts I will talk a lot about “losing weight,” but really for me it was, and is, about getting in shape. If I lost pounds on the way to getting a stronger, healthier body, then I was very pleased about that. But it was more about taking care of the body God gave me so that I could serve Him longer. I was (and even more so now) getting very disappointed at how many of “God’s servants” did not seem to care about their body and how restricted they were in being able to do ministry. I was a poster child for that. I have very few pictures of how big I was at over 270 pounds. However, I have a ton of pictures since. Most of them no one will ever see, but it is a huge encouragement to me to go back and look at the steps that got me to where I am now. There are all kinds of methods for measuring your progress. Many of them may be just fine for some people. But here is what worked for me. Weighing yourself only gives part of the picture of what is happening in your body. Once you start exercising you may actually gain a bit of weight while you build muscle to replace the fat. If you only depended on your scale to tell you something is happening then you could be easily discouraged. I initially took body measurements from several points, but settled on just taking a measurements at my neck, upper arm, chest, waist, hips, thigh and calf. I took each of these measurements once a week and recorded them on a 3X5 card. I also put the date and my weight on the card. I was able to get 5 or 6 columns of measurements on a card so that I could see how I was doing over a long period of time. I also rubber banded these cards together so that when I filled up a card and put it with the rest I could see how far I had progressed. I noted on the card what my total number of inches and pounds I had lost since I started. After almost 6 years I still have those cards that I can look at for encouragement. Some weeks my weight would go up even though my measurement went down. I was never discouraged by that. If I looked smaller I didn’t really care if I gained 2 lbs. Muscle is denser. A pound of muscle takes up less room in your clothes than a pound of fat. While measuring will give you a better understanding of what is truly happening, don’t we really want to talk about pounds? We like to say that we lost 5 lbs. No one really cares or understands when you say you lost a total of 3″ from 7 different points on your body. This is where I deviated greatly from most suggestions. You can take my route, or stay with the conventional wisdom. My way worked for me, it may not for you. However, if you have never been successful at this before doing it the traditional way, then maybe it is time for you to look at alternative suggestions. I weighed myself every day. I weighed myself every night. I weighed myself sometimes 3 or 4 times a day. Conventional programs tell you to only weigh once a week. But for me I wanted to know where I stood today compared to yesterday. I was challenged by that number and rarely discouraged. If I was up a pound (or three) in a 24-hour period I would chalk it up to “water weight.” If I was down it was because “I worked hard for it.” Now that I have a scale with tenths of a pound on it, I get even more obsessive in seeing what I can make those numbers do from day to day. Although I weighed myself daily, I only wrote down my weight once a week on measuring days. This gave me a better chance of being down between one permanent accounting and the next. The daily weights were temporary and just helped me see if I was generally on track. Also, by doing this, I knew that Thursday my weight was always the highest for the week. I would avoid measuring or recording my weight on Thursday. More on why in a later post. My wife was a saint during all of this. 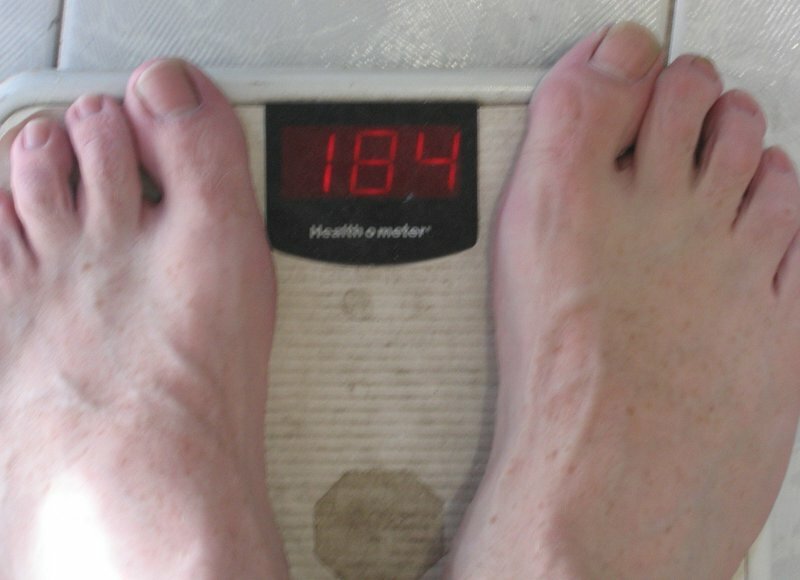 When someone said that they noticed I had lost a little weight, I would gloat to my wife about it. While I am writing about it now, I did not want to make a big deal about losing weight at the time. It was a personal issue to me. I was not losing weight for other people, I was getting in shape so that I could serve the Lord better. But if anyone happened to notice and say something about it, I was thrilled! Outside I would answer questions and thank them for their kindness, but inside I was beaming with the knowledge that I had worked hard and it was paying off. My wife had to listen to me drivel on and on about how someone noticed. Or that I could do a certain stretch that I had never done before. She had to listen to a play-by-play accounting of everything that was happening to me. It was helpful to have someone I could talk to about it. Along with the encouragement, there were also plenty of people who were standing around to throw cold water on me and my progress. My poor wife got to hear all about that too. I carved out a time to make exercise part of my life. I realize my schedule is more flexible than most people’s, but I think they could make time if they really wanted to. You don’t need 3 hours a day to exercise. If you will look for opportunities to walk 15 minutes more than you do currently, then you are headed the right direction. By the time I got 6 months into my change of lifestyle I was exercising 4 to 7 days a week. Not because I had to, but because I wanted to. I was seeing results in a changed body. I had less heartburn. I could stay awake during church. I didn’t seem to have as many aches and pains. I wasn’t getting sick. I wanted more of those types of results. But then the comments started. “Men are able to lose weight easier than women.” “You just have a faster metabolism than I do.” “Are you sick?” “You are making the rest of us look bad.” And they kept coming. Sometimes they were intended in jest, but they were not helpful. I never tried to refute the discouraging remarks. If someone really wanted to get their life turned around, I was there to help, but I really started to retreat from even talking about anything I was doing food or exercise-wise. There were too many people who were either jealous or didn’t want things to change. When I was asked what I was doing to get the results I was getting, I told them that I was just exercising. (Early on, I changed very few eating habits). Often they would tell me how they were too old or that they preferred to diet instead of exercise. I wanted to turn it back around on them and ask them who was getting better results, but I refrained. It may be true that men lose weight easier than women, but I did not see any of them working as hard as I did. I did not see them walking in the neighborhood drenched in sweat. When I later joined an exercise group at a local park I noticed that many of the people in the group were showing up every day, but not physically engaged. They were going through the motion, but were not putting forth the effort to make the exercise work for them. I only remember 1 lady who ever lost weight in that group. It wasn’t because the teacher was doing a poor job (I lost over 50 lbs. under her), but it was because the students were not putting out the effort that it took to get the results they said they wanted. You cannot get in shape without effort. However, let me encourage you that you don’t have to spend 20 hours a week in exercise. If you are at a constant weight now and you change nothing in your eating habits, but add walking 30 minutes a day to your routine, you will lose weight. It is a matter of using more energy (calories) than you consume. If that 30 minutes a day has to be scaled back to 10 minutes, you will still lose weight, just at a slower pace. I will talk about that in my next post. Thanks for the comments here and at Facebook. Also thank you for the personal messages that this has been helpful and encouraging. While I have talked about many of my activities in the past on the blog, I have never shared everything. It seemed too personal at the time. However it is helping to encourage me to ramp up my effort and stop hiding behind a couple of recent injuries. I will find a way to work around these issues and get back in the shape that will help me effectively do the ministry the Lord has called me to. Solid advice (walking 15 minutes) and great motivation! Sign me up for Part 3….